There’s always a counterfeit offer in the world for what Jesus offers, often it looks shiny and nice for a little while but soon turns to ashes. Many people have looked here and there and found what they thought were answers only to see them dissolve. Relationships where they thought they’d found the one who would make them happy, careers with power and prestige that give them public recognition but emptiness in their soul, religions with promises of peace or prosperity that end in pain. Hope maybe the biggest counterfeit of them all. We put our hope in all kinds of things that offer no guarantees. So many are hoping that their 6 numbers will come up, with that kind of cash, surely all their problems would disappear. So many people are putting their hope in long shot waiting for the big pay off or the easy answer, just for the chance that someone or something is going to pull through and then they’ll be set. But that’s no real hope at all is it? Paul tells the Romans about a different kind of hope. It’s not a fleeting hope. It’s not a roll of the dice. It’s not a statistically calculated system with high probabilities of success. Sometimes I wish we had come up with a new word for it, sometimes our language is so limited and twisted that its meaning goes right over our head and gets lumped into the counterfeit offer. No, Paul is telling them to celebrate because of the real offer that’s been put on the table. There’s no fine print legal jargon that goes with it. There’s no conditional clause to give a back door retraction of this hope. It’s a real guarantee, the kind our generation doesn’t know much about anymore. The kind of guarantee where if you were told something wasn’t going to break, it didn’t break. It lasted for your whole life and you passed it on to your kids. When you find this hope, I mean really find it, you know you’ve been given something that’s not getting returned. You don’t need to buy the extended warranty in case it breaks – the manufacturer warranty will do just fine. It’s bulletproof. For Paul, when they called him Saul, hope was found in rules and laws and systems and ceremonies. He knew them inside out, front to back, an expert in all things religion. He could argue the points and enforce the consequences of missing them. What happened to Saul happens to everyone who gets devoured by religion. He knew everything about what the scriptures said about God, he’d just never met Him himself. He turned angry; he turned violent toward those who had met Him. He tried to exterminate them. His heart was cold because he’d search for hope in something that offered no hope at all. His heart was bitter because he saw people who had found hope outside of where he thought it was to be found. But Jesus is mercy and offers it to everyone. He met Saul and showed him what real hope looks like. The change was total, even to the name he was known by. Paul, the new creation in Christ Jesus, would help spread the hope he once tried to exterminate around the known world. So great is this hope, we can all rejoice and help spread it, just by telling people about Jesus; His life, death and resurrection to set us free from the power of sin and death. A hope that last, a hope that is secure, a hope that comes with a promise that, one day, all this mess we’re in will be made right. But in the mean time, as we look confidently ahead to the day when Jesus turns everything around, our hope gives an ability to be patient in trouble. Trouble is coming, I promise (actually He promised). Persecution for following him, ridicule just for mentioning his name, loss, sacrifice, pain; the realities of living out our hope in fallen world. But with our hope, that assurance that he’ll rescue us, comes a new found gift, a new found source to draw on. The Holy Spirit that is given gives us the facility to be patient, to get through, to wait it out, to look forward to something better, to survive and even thrive in the face of what looks like sure failure. Trouble comes but it’s no match for anyone who waits on Jesus to rescue them. Rescue is coming. He is coming. Hold fast. But how, how can we withstand the trouble, how can wait out the storms? Keep on praying. Keep Him in the front of everything. Keep him at the center. Let him bring up the rear guard. His Spirit has linked you together with the Father and the Son, so that you need never be disconnected again from the one who created and sustains you. In fact, even when you don’t know you’re praying, he is praying for you. The light is always on, the door is always open. As you pray, the mess that looks so monstrous fades in the light of hope that is immovable. As you pray, the doubt that looks so daunting becomes a mole hill shadow of the hope that is indestructible. As you pray the fear that is so paralyzing pales in comparison to the assurance in the hope that is perfected in your faith by the one who loves you perfectly. Keep on praying, keep on getting closer to Jesus, keep on listening to his response. This offer is for real, this offer is legit. 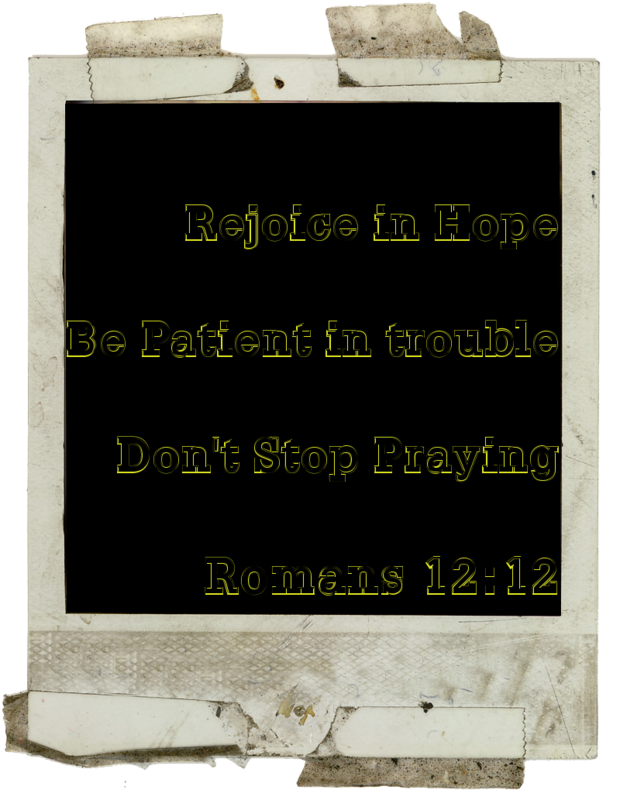 Rejoice in Hope, Be Patient in Trouble, Don’t stop praying.